I’ve been a very bad blogger the past two months, and for those two of you out there who actually read my blog, I do sincerely apologize. I don’t have great excuses for not blogging more regularly, except I had to put my life on hold for most of the month in April through the beginning of May when I was out of state, at a film festival, and saying good-bye to my grandfather. Also, I just didn’t have much I wanted to share with the public at that time. Mine is neon yellow and green. Also, I write in it with purple ink. But I won’t dwell on that. One of the the best things that’s come out of this blogging absence was my paper journal. Frustrated with the snail-like progress of my novel, and constantly being paralyzed by my recurring case of writer’s block, I tried a new tool to wrench me out of my writer’s stupor. 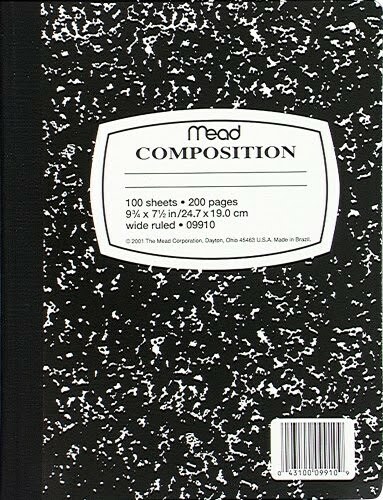 I invested in a paper notebook to record what I was going through while writing my current novel, and declared it a private journal to record my day-to-day headway. I’m happy to report I’ve begun writing nearly every day in this notebook as a result. I’ve given myself notebook rules to help me stay in a regiment (although I’ve already broken some of them). But even though I’ve strayed a little, generally, I’ve been very good with it, and that’s saying a lot for someone who has been trying to cope with a debilitating case of S.A.D. this past winter. What has developed is a record of my back-story during the writing of this novel, noting the bursts of inspiration and the day-to-day struggles I encounter along the way. My journal has also served as an outlet to express frustrations, while I literally figure out my quandaries in the pages; when they come, the victories burst forth with that much more exaltation. And the more I’ve stayed on with my journal, the more I’ve discovered about my story, and the more I’ve just plain written. Obviously, I didn’t invent the idea of journaling while concurrently writing a novel. One of my very favorite authors, John Steinbeck, would keep a journal while writing his greatest epics, The Grapes of Wrath and East of Eden. As a student at Columbia, we were encouraged to keep a daily writing journal, but I didn’t grasp how to really go about it in college. I didn’t see the full benefits, because I was just discovering myself as a fiction writer. Also, I was writing so much for assignments, I felt like I had no time to write journal entries outside of the mandatory assignments. What also kept me from being interested in journaling then was the pressure to write about specific topics, which is actually more like how people conduct their blogs to stay interesting or relevant. This is not what a “journal of a novel” is all about. All I care about is getting out my story. 1. Write something every day in this journal. It doesn’t have to be more than ONE SENTENCE. As long as it’s dated and it is relevant, it is still driving my thoughts forward in writing this story. 3. From now on, all notes to self about this NIP will be entered here, so it’s easier to find and catalogue. That’s about it. Now go write for real!